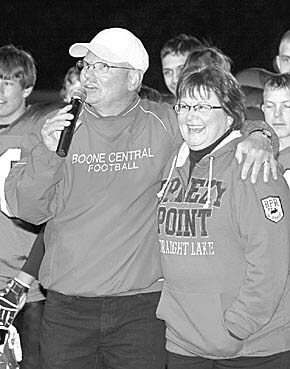 Boone Central High School football coach Arnie Johnson addresses the crowd gathered to honor him on reaching the 200-win mark last Friday night. “I’m sure glad we won that one,” said Johnson in relief after the Cardinals edged O’Neill 3-0 for win #202. More in the Oct. 19 Albion News and Petersburg Press Print & Electronic Editions.